Three products to help you get more vibrant skin and a younger looking face. Includes internationally-acclaimed Fumiko Takatsu’s book The Ultimate Guide to the Face Yoga Method, the Sonic Face Brush, and the DermaRoller. The Face Yoga Method Sonic Face Brush uses sonic frequency to clean, massage, and exfoliate your skin, leaving firmer, more elastic skin. The DermaRoller reduces fine lines, wrinkles, and scars, and rejuvenates the skin by increasing collagen and elastin production. It contains face exercises that has taken Fumiko 15 years to put together, covering all areas of your face. There are chapters dedicated to diet and skin care tips. Learn how to tone your face in The Ultimate Guide to the Face Yoga Method, then stimulate collagen and elastin production with the Sonic Face Brush and DermaRoller tools resulting in firmer, more youthful skin. The Ultimate Guide to the Face Yoga Method reveals Face Yoga expert Fumiko Takatsu’s secrets to getting a younger looking face, more vibrant skin, and a life you love. Learn to tone your face in just 5-10 minutes a day. 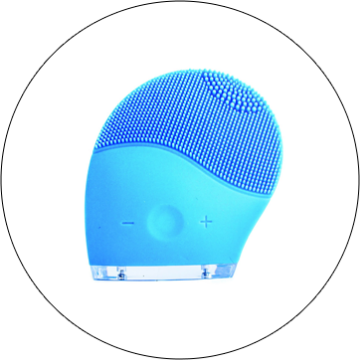 The Sonic Face Brush uses sonic frequency to clean, massage, and exfoliate your skin, leaving firmer, more elastic skin. The full directions on how to use the products will be mailed to you with your products. If you can't wait, you can also download the postcard with the full directions by clicking here. 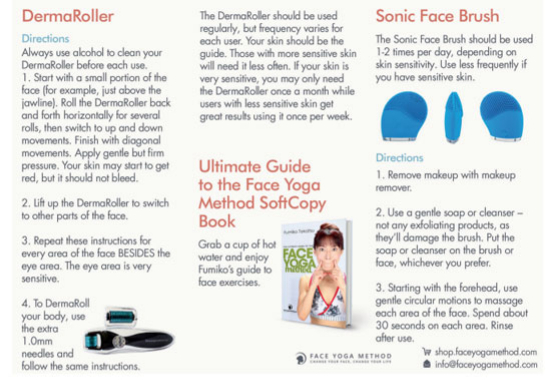 "I've received the Face Yoga Method Essentials Trio and the tools just work amazingly. I could see improvements on my skin and experienced more radiance since the very first time I used them. I would advice anyone to get them. Thanks Fumiko"
"Thanks so much I received the items I am so very happy about them. Gratitude Piera"
⭐⭐⭐⭐⭐ - Piera Maria Alexandra V.
"I only got this product a few days ago and the moment I started using both the Sonic Face cleanser & the Face & Body derma roller - coupled with the face exercises I saw results. OF course I understand that I need to keep at it to get all the results I want. For me, it's the jaw line that I want to define and I want to reduce the lines on my forehead. I'm 66 years old and I had no jaw line to talk about. It is starting to get much better. With the forehead lines it was instantaneous. Now I need to keep reminding myself not make so many faces in order to keep my forehead line free. It really works! I am amazed. I am very happy with the results so far and I intend on keep working at it. I don't have any camera to take pictures of myself. I will go to the mall to get a before & go back to get the after within a few months to show you the difference... I know for a fact that there will be a difference. Thank you so much. This bring much joy to me." " I am using the Sonic brush to help me put on moisturizer.The book is an excellent gift,I am using it to help with the Certification Course.Thanks.Dr.Leticia Ortega. " " Wow, Face Yoga is amazing. I do it for 2 month and already look better. Also the Products are high Quality. Thank you! Love and Peace Madeleine"
" The facial cleaner works extremely well; making your face shiny & clean. The roller brushes seem to help with rejuvenating the body skin. " " Great items in the pack with very easy instructions. I can already see a difference in my skin "
"So far I am loving this. Find myself doing this more than what is needed. Feels so good. I have been taking pictures and excited to be on day 23. I will post pictures later. Fumiko is so much fun to watch. I am glad we found each other. I love the sonic face brush. I use it as a relaxation message for my face. So so relaxing. Haven't yet used the Derma Roller. Book is a nice size and enjoyable to have as a back-up. Highly suggest getting the bundle." " My gift package arrived so quickly. I'm so glad I didn't have to wait 4 weeks! The silicone brush feels so healthy and clean when I use it. It's great on trips because it's so compact. I like to refer to the book instead of electronic devices later in the evening. The roller wands are stimulating and I feel like it is such a good way to prepare my skin for special products. Thank you , Fumiko! "